Because of our constant and unquenchable thirst for the written word, I’m generally on the lookout for new and exciting ways to structure “book reports”. I want my children to be comfortable retelling a story in their own words in many different formats. 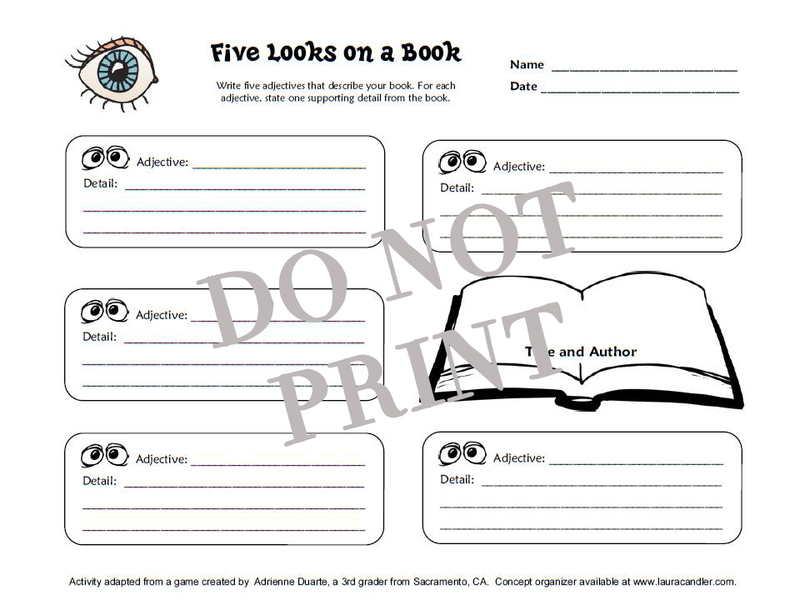 A delightful recent find is called “Five Looks On A Book” from Teaching Resources. The idea was first thought up by a third grader from California, and then made into a printable by Laura. The worksheet requires students to come up with adjectives about their book and details to support those describing words – I think it’s quite genius. Please do not attempt to print from the below images – these are free resources that can be found by clicking over to Laura Candler’s Amazing Website. The pdf printables are at the bottom of her Reading Workshop page. You select an adjective from the list below, or come up with one of your own, then fill in a detail supporting that adjective as a description of the book you recently completed. Continue until you’ve filled in 5 attributes and sentences. 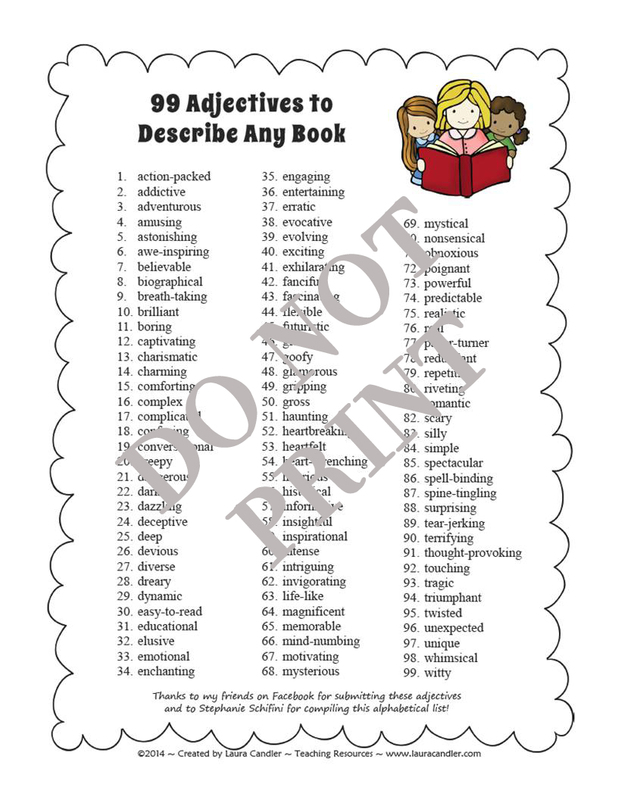 I laminated the 99 adjectives page (because, laminating makes everything more incredible) so my daughter can just keep it for reference in her book box. She completed this activity today for “Number The Stars” and included dangerous, untruthful, scary, funny and sad as her adjectives. Her “untruthful” sentence was regarding the protagonist’s parents and uncle lying to German soldiers about the coffin they are mourning around — it made me laugh that a lie (even one for a good reason) made such an impression on Madison. This strikes me as a quick and easy way to get the flavor of what your student thought of the book, without a long drawn out report. Madison’s adjectives have provided me with a good jumping off point to delve into a deeper conversation about her thoughts. Since she reads constantly, I needed something simple enough to apply daily without overwhelming her. 5 Looks on a Book is going to work beautifully. Again, the printables are located over at Teaching Resources. Thanks Laura!